Last week I read a very interesting book. 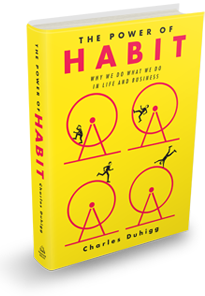 It is called The Power of Habit by Charles Duhigg. The book talks about how habits form and how they can be changed. In our life, most things we do are not thought. We do it without thinking. They have become a habit. Charles also shares one interesting concept in his book. It is called 'Keystone Habit'. He says, some habits are more important than other habits. These keystone habits, if changed in turn influence all other habits and transform the individual. Example, for some people going to the gym or doing Yoga is a keystone habit. If such a person starts going to the gym, he also becomes careful of what he eats. He will start going to office early and he becomes more punctual in his life. He might also start working more seriously and take less breaks at work. We all have our keystone habits. After reading the book, I started to apply it to making presentations. When we asked to make a presentation, we do a lot of things out of habit. We don't even think about it. Some people waste hours choosing the right template. Others might spend too much time in slide beautification. We all have things we constantly do. We know they are not adding much value but we continue doing them. Sometimes we might not even know we are stuck in such habits which are wasting our time and making us less productive. In the context of presentations, I believe the keystone habit for most presenters is 'rehearsal'. Most people do not rehearse before their final presentation. If you can change just this habit and start rehearsing, it will positively affect all other habits related to presentations. Think about it. Rehearsal is a very powerful thing. When you rehearse your presentation, you touch all other aspects of your presentation. You get a chance to set the flow right. You can come up with new and better content and better arguments. You can check on your slide design and animation. You can get thoughts on how you can shorten your presentation without losing its effectiveness. Rehearsal is a keystone habit. In order to become a better presenter, do just one thing now. Start rehearsing before every presentation. Rehearse at least 5 to 10 times and see how it transforms you into a much superior presenter. To rehearse is to do a mock run. You can do it alone or present to a friend/colleague. You stand up, put the PPT in slideshow mode and present it as you would do eventually to your audience.